The mobile telephony sector has not just plateaued but begun a downward spiral, with revenues dropping for the first time in a decade after Reliance Jio’s entry, by about 20 per cent. Considering the staggering government collections of around Rs 3,00,000 crore by way of charges and taxes over the past decade from investments of about Rs 2,00,000 crore, it would appear that the sector has paid too dearly. The irony is that this inflection point comes when there’s been much ballyhooing about a vigorous push for Digital India, whereas the reality in telecommunications is that conditions are more difficult, with easy markets saturated and average revenues per user dropping, while the need for capital expenditure is higher. The organisational issues are of a broad social and political nature: (a) An uncoordinated, disunited way of functioning, including our approach to infrastructure in general, and broadband and communications in particular, (b) a divisive political process that rewards opportunistic disunity while discouraging unity, (c) a demoralised and disgruntled administration and technocracy, resulting in an erosion in the standing of civil servants, technocrats and other professionals, made worse by attempts to manage by coercion. It is best to acknowledge and accept these as problems to be overcome, instead of being in denial. Consider these in more detail to appreciate the nature of what we’re up against. Government departments in India have functioned in silos barring rare exceptions, without an active work culture and processes for coordination and convergence. While central and state government procedures enable the Cabinet secretary and chief secretaries of states as heads of administration to exercise interdepartmental coordination, ministries and departments have tended to be turf-conscious and maintain an inward focus, either consciously or by default. Episodic instances at coordination have been the exception. Yet, what is often essential for practical solutions to complex interdepartmental issues is a collaborative approach. 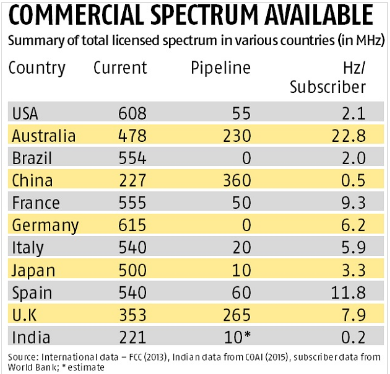 Consider the example of spectrum, of which every country has the same amount: The relative shortage for commercial use in India as shown in the table below, and the multiple agencies that need to coordinate and converge on spectrum policies. The Telecom Regulatory Authority of India is responsible for recommending spectrum use; the Wireless Planning and Coordination Wing in the Department of Telecommunications, the Ministry of Communications, is responsible for spectrum allocation and licensing; and agencies such as Doordarshan under the Ministry of Information and Broadcasting, the Indian Space Research Organisation in the Department of Space, and the Ministry of Defence, are assigned certain bands of spectrum. Finally, the Ministry of Finance is responsible for all government levies and collections. The turf issues are such that they need the active intervention of the Prime Minister for resolution. There is also an irrational yet widely held opinion that aligns with an interpretation of the Supreme Court (SC) verdict on the 2G scam, that is viewed as favouring auctions and maximising upfront government revenues. Whereas the judgment allows government to formulate other policies and act on them, and despite the detrimental effect of auctions on services, and that the consequences are not in the public interest. For beneficial policies, the constituents have to analyse and understand the causes of the problems and possible mitigating steps, to converge on policies in the public interest. Too much to hope for? Perhaps, yet this is only one aspect of a multidimensional requirement. Another major aspect is that our political processes favour dissonance and disintegration over order and convergence. It pays to create factions, run down the opposition — in this age of crassness, the more viciously the better — and to control the swing vote to opportunistic self-interest. The way our political systems are structured, divisive and disruptive tactics that exploit populism are easier and more effective than building consensus, because funding is more easily available to breakaway politicians serving factional interests, than to those trying to work together seeking common ground. This highlights the problem of political funding, and the need to rationalise this to align with societal benefits, instead of as it is currently, to society’s detriment. “Each bit of natural resource expended must bring back a reciprocal consideration. The consideration may be in the nature of earning revenue or may be to ‘best subserve the common good’” (http://www.supremecourtofindia.nic.in/outtoday/op27092012.pdf). Politicians and administrators construe this to mean that it is safer to resort to auctions, ignoring the fact that in the case of spectrum, the resource is not expended because it is reusable, and there’s no excuse for not subserving the common good.